Are you planning a shower, reception, or a graduation party? 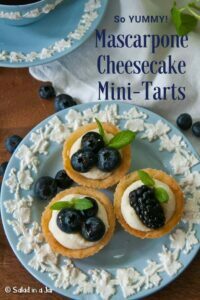 These Mascarpone Cheesecake Mini-Tarts are a sweet idea perfect for any celebration–except maybe a kid’s birthday party. Change the fruit/flavor to suit your tastes and/or color scheme. Are you having or helping with a party? Looking for something easy to serve, easy to eat, and easy to make? Do you need a particular color or flavor. Why Mascarpone Cheesecake Mini-Tarts are the best dessert for showers, parties, and buffets. No slicing. You also won’t need to transfer a precariously balanced fancy dessert (like a layer cake) to another plate. 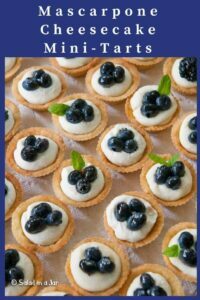 Individual servings like these mini-tarts are insurance against a dessert that gets mangled on a buffet. These mini-desserts are easily one bite for most men and not more than two bites for us more delicate types. In casual settings, you may not even need forks. Make or buy the crusts ahead of time. The filling is uncooked so it requires only minutes. The only detail to be completed at the last minute is adding the fruit to the top with a touch of glaze. Easy to customize for a specific color theme. Change the fruit to change the color scheme. Change the flavor of the filling from lemon to orange or lime if you like. Or make it plain vanilla. If you have followed this blog for more than a week or two, you know I love to make mini-tarts with various fillings. I don’t need much of an excuse but I recently had a good one. 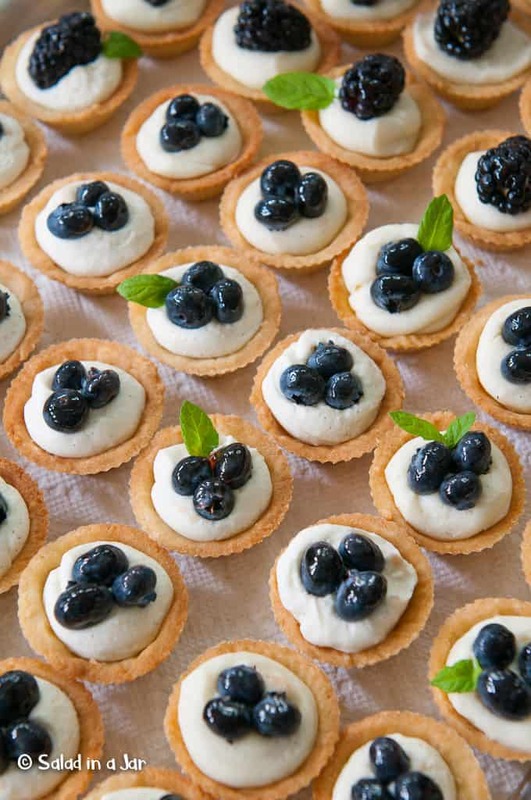 I accepted an assignment to make blueberry cheesecake tarts for a wedding shower at our church. The bride picked a blue color scheme, so blueberries and blackberries were the obvious choices for the fruit on top. Because I enjoy shortbread more than graham crackers (unless they’re homemade), I wanted to use my favorite shortbread crust recipe for the tart shells. However, store-bought shells are perfectly acceptable. Whether homemade or store-bought, the mini-tart shells are pre-baked. Therefore, an uncooked filling seemed preferable to the traditional baked cheesecake filling with eggs. I used to work with a gal (Hi, Daphne) who put me on to mascarpone cheese. It’s the fancy, more expensive, creamier, and Italian cousin of cream cheese. If you can’t find mascarpone at your grocery story, you could substitute cream cheese. Did you know you can make your own mascarpone cheese? I just tried it myself last night. Wow! That stuff is dangerous! Back to the tart filling…mascarpone cheese combined with melted white chocolate chips and sour cream create a little bit of heaven in your mouth. Fold in some frozen whipped topping (sorry, I know–not the healthiest ingredient, but you won’t be getting that much unless you eat the whole batch) to lighten the mixture. A touch of vanilla bean paste adds sophistication. That’s it. Spoon or pipe the slightly-chilled filling into your tart shells for a two-bite dessert just rich enough and sweet enough to enhance whatever fruit you choose to put on top. Here’s the best news of all. You can prepare these little jewels at least 2-3 days ahead of time except for placing the fruit on top which should wait until you are almost ready to serve. Melt white chocolate chips in a small oven-proof bowl in a microwave. Heat for 45 seconds on 50% power and stir. Repeat until chips are melted. Add chocolate to cheese and whip. Then add sour cream and keep whipping until well-combined. Use a light touch and a spatula to fold in the whipped topping just until filling is smooth. Spoon or pipe (ziplock bag with a small snip across one corner works well) filling into baked mini-tart shells, either store-bought or hand-made. Chill. Before serving, add fruit of your choice. Refrain from washing the fruit, but gently wipe each berry clean with a damp paper towel. Lightly glaze fruit by dabbing melted apple or currant jelly onto each piece of fruit after you have placed it on the tart. No worries if you have the occasional drip. Please note the amount of tarts you end up with is in direct proportion to the size of your tart shells and how much filling you put in each tart. I use these tart shell liners from Amazon if you want to know the size you see in the pictures. Well, these look yummy, Paula. Interesting that you are making your own mascarpone cheese. I have gotten into soft cheese making lately. I just received some cultures from New England Cheesemaking for creme fraiche, sour cream, sweet yogurt, and buttermilk. I plan to make quark with the buttermilk culture. So I will be looking for your recipe for mascarpone! I actually got Ricki Carroll’s book from the library, and she also has a couple of recipes for mascarpone in her book, I just had not gotten that far yet. By now, you know me, always a kitchen experiment going on at my house. Look forward to your next post! Have a great weekend, and Happy Mother’s Day. Ok Becky, that does it. I totally want to buy the house next door to you and be your neighbor/best friend. I can’t even imagine all the trouble we could cook up in our kitchens.